SHANGHAI — The second edition summer issue of Eco-nomy, the new compendium of news and ideas about sustainable business, includes a piece from Circle of Blue’s Choke Point: China project earlier this year on the confrontation between water and energy in China. The page-long article is in Chinese, which is appropriate given that Eco-nomy is a fresh voice in Asia for describing the profitable alliances that develop when companies apply ecological principles to their business models. The current issue includes pieces on London’s plan to turn the 2012 Olympics into the greenest games ever, Michigan-based Haworth furniture company’s two environmentally-sensitive and worker-safety oriented factories in Shanghai, and a smart piece on green marketing in China by Olgilvy and Mather’s Hannah Lane that asks whether Chinese consumers are willing to value sustainability in their purchasing habits. She is convinced they are. I also like the solid piece on China’s challenge to ensure safe food. The latter was reported and written by Haiyan Sun, the magazine’s chief editor and co-founder, who gave birth on Saturday to a baby boy, her second child. This week I arrived in Shanghai, my fourth trip in the last year to China, and my second to this modern supercity of 23 million people. On Tuesday I sat down with the magazine’s other co-founder and editorial director, 29-year-old Yang Sun, a business journalist from Jilin City in China’s northeast (and pictured above). The magazine’s goal, in a polluted nation where environmental principles do not yet figure prominently in mainstream values, is to show Chinese business leaders and government officials just how much more money can be made by embracing cleaner and greener practices. That’s an essential thought in a country that is pushing its natural resources to the limits of productivity, running low on water, adding to an already astonishingly large number of people, and climbing a steep upward curve on energy production. Frankly, China’s economic and environmental security rests on its capacity to be much more inventive and efficient than the West has been in tapping its natural wealth for economic development. Yang said the magazine developed from “The Age of Green Gold,” a book on sustainable business that she and Haiyan published last year. A Chinese executive who read the book approached the two young writers with the idea of producing a magazine, and has provided the financing for the first year of operation. The two editors developed a string of correspondents to file dispatches from around the globe. Each of the two editions have articles in Chinese and English and have been distributed at no charge to readers. Expenses run about $16,000 a month, and the magazine has established a non-profit business model. 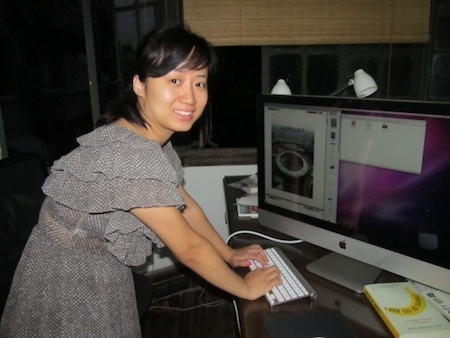 Unfortunately Eco-nomy has not developed a Web site, which is in the design stage, Yang said. To secure a copy write the editors at tanshang2011@gmail.com.